All are welcome to participate fully in worship and to receive the Sacrament of Holy Communion. From September to May, we worship on Sundays at 8 a.m., 9:15 a.m., and 11 a.m. and celebrate the Eucharist at each service. In the summer months, and for special occasions, the 9:15 and 11 a.m. services are combined into a 10 a.m. service. Children are welcome at all services, and activity bags are available in the rear of the church. There is ample room at the rear of the church for young children and their parents to stand and play when sitting in the pews becomes a challenge! The 8 a.m. Rite I said service lasts approximately 45 minutes. Afterwards, attendees meet for coffee and light breakfast in the Parish Hall. The 9:15 service is more oriented to families with children and youth, although not all attendees have children. Music includes the Lift Every Voice and Sing (LEVAS) Hymnal, music from the Taizé and Iona communities, and guitar and other musical instruments. This service features a Family of the Week, who assist with ushering, offering and readings. In addition to a general Rite II format, the congregation is very receptive to alternative liturgies, including A New Zealand Prayer Book, Enriching our Worship, The Iona Prayers and the occasional special liturgies posted on the national Church website. During the Communion, congregants come to the front of the church and gather around the altar, and the bread and wine are distributed to the gathered group. Vested acolytes and verger are joined by chalice bearers who sit in the congregation until the Offertory. The 11 a.m. choral Eucharist is a Rite II liturgy which includes sung settings of the congregational texts, and offertory and communion music sung by the choir. Chanting of the Eucharistic Prayer is optional at the discretion of the priest. Afterwards, participants enjoy coffee and refreshments at “Take Ten,” hosted by members of the congregation. Swarthmore College students often join the congregation at 11 a.m.
*In the summer and on special occasions, the 9:15 and 11 a.m. services are combined into a single 10:00 am service. The summer 10 a.m. service often features different liturgies, such as the use of A New Zealand Prayer Book, and is followed by “Lemonade on the Lawn,” hosted by various families. ​The Centering Prayer Group meets on Monday evenings at 7:30pm in the Cleaves Room. Trinity's Centering Prayer Group is a part of the Contemplative Outreach of Southeast Pennsylvania and the national network of individual groups for support and education. The practice of Centering Prayer casts new light and meaning on all forms of prayer; members meet to read, study, share and "sit" in silence together. All are welcome to participate. For mid-week worship, we gather in the Choir Chancel on Wednesday mornings at 9:30am for Holy Eucharist and prayers. 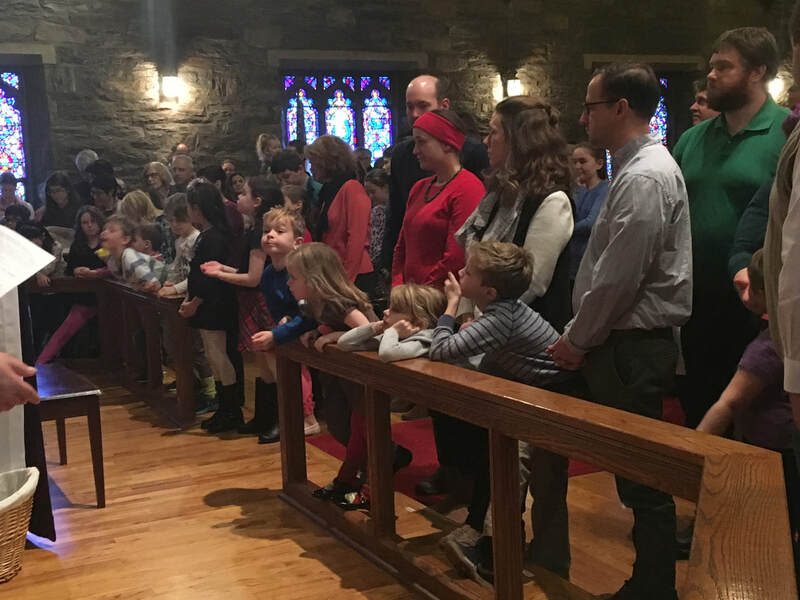 Little Crum Creek Park, Confirmation, Rite 13, Blessing of the Animals, All Saints and All Souls observances, the Christmas Pageant, Christmas Eve, Ash Wednesday, and Holy Week services.